WhatsApp, as we all know, supports only one account per device. But sometimes you might want to use two different accounts simultaneously – for instance, one for your friends & family, and another for your colleagues at the office. One way to achieve this is to get a secondary smartphone to use WhatsApp with a secondary account. But this isn’t quite a feasible solution, especially if you have only one smartphone available with you. Another possible alternative would be to keep two different versions of WhatsApp installed on the device, and use two different accounts on each of those. In some of our previous articles, we have demonstrated how to install certain apps from outside the App Store without jailbreaking the iOS device. Some of these apps were tweaked versions of the original ones, with certain extra features included. But here too, there’s a catch — you can’t keep both the original and the tweaked app simultaneously on the same device. Luckily, there is a way to install the tweaked version of an app, without deleting the original one. In this article, we’ll explore how to do this. Note: WhatsApp++ is a tweaked version of WhatsApp which includes additional features that are not available in the official app. In this demonstration, we’ll be installing WhatsApp++ on an iPhone that already has the official WhatsApp client installed. You can read more about WhatsApp++ from this article. All iOS apps have a specific set of parameters that define their installation behavior. The value of these parameters can be modified by the developer before building the app using Xcode. One such parameter is called “OVERWRITE_ORIGINAL_APP”, and its value is set to True in most cases. This is generally done to avoid duplication of an app whenever an update is installed. But in our case, the app should not overwrite the original. Thus, we need to create a modified version of the app, where the “OVERWRITE_ORIGINAL_APP” parameter is set to false. This would allow the user to keep two different versions of the same app simultaneously on the same device. Note: The following method requires the use of Xcode, which is currently available only for Mac. You may be able to download the WhatsApp++ IPA file from different sources on the Internet. But it’s difficult to find a reliable source, since apps available in third party repositories may contain malware. Another issue with free third party repositories is that they are unlikely to maintain the apps to their latest version. On the contrary, Build Store is a paid third party iOS app repository that maintains its apps to their latest releases, and also verifies them to be malware-free. You can find WhatsApp++ on the Build Store. In order to access any IPA from there, you must have an active Build Store subscription, which costs $9.99/year per device. You can find more information about Build Store from this article. Getting the IPA from Build Store isn’t straightforward and involves a certain workaround. After you have signed up for a new Build Store account and activated your subscription, you need to perform the following steps in order to get the IPA file. Open WhatsApp++ app page using Safari on iPhone, and tap on the INSTALL button. After Build Store verifies your account, RUN button will appear. Tap and hold the button and select the Copy option. Now transfer the copied link to your Mac via any clipboard transfer app or sending the link to yourself on any IM app and accessing it from the desktop. The copied link will contain the URL of a Plist file. You can find the URL in the text succeeding “action=download-manifest&url=” portion of the link. Open this URL in a new browser window on your Mac. The Plist file will be downloaded to your computer. Open the Plist file using an editor such as TextEdit and look for the line containing “<key>url</key>”. In the succeeding line, the <string> attribute will hold the URL for the IPA file (enclosed within <string></string> tags). Copy the URL and close the file. Now download the IPA file from this URL. Now that you have the IPA file, the next step is to rebuild the app in such a way that it doesn’t overwrite the existing app during its installation. For this, you need to ensure that the “OVERWRITE_ORIGINAL_APP” parameter is set to False before rebuilding the IPA using Xcode. In this demonstration, we’ll take the help of a third party Xcode project called ppsideloader, which is available for download from GitHub. Download and extract ppsideloader to your Mac. Go to the extracted folder and delete the “app.ipa” file present inside. 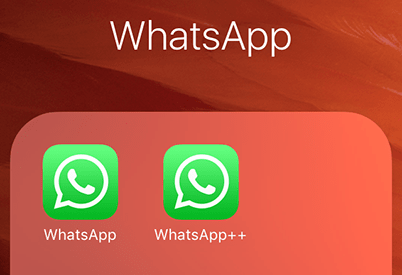 Copy the downloaded WhatsApp++ IPA into the ppsideloader folder and rename it as “app.ipa”. Open the PP_SIDELOADER_OPTIONS.plist file in the same folder. Save and close the Plist file. Now connect your iPhone to your Mac and double click on “ppsideloader.xcodeproj”. Xcode should now launch the ppsideloader project. Go to Xcode >> Preferences. Click on the ‘+’ button in the Accounts panel and choose “Add Apple ID…”. Select the Account you just added and click on View Details on the right side. Under Signing Identities, click on the Create button adjacent to iOS Development, and then click on Done. Select the ppsideloader project on the left pane. The project preferences will show up on the right side. Provide a unique Bundle Identifier name, something like “com.myaccount.ppwhatsapp”. In the drop down for Team, select the account that you just added in Xcode. Click the “Fix Issue” button and sign in with your Apple ID (if necessary), and set the Deployment Target to your iOS version. Click on the Play button on the top of the Xcode window. Xcode will now build the app and install it on your iPhone. During this, Xcode may ask for access to your keychain. Just keep clicking on Allow, or select Always Allow if you don’t want to be bothered by repeated prompts. When the deployment is completed, WhatsApp++ will be installed on your iPhone along with the original WhatsApp. Now that you have two versions of WhatsApp installed, you can log in to both of them with different phone numbers and use them simultaneously. Of course, you’ll need to verify your secondary account, so ensure that you provide a valid phone number which is active and available with you. Using WhatsApp++ gives you many additional features, such as app lock with passcode or TouchID, Selective Read Receipts, Disable Delivery Receipts, etc. You can get the full list of available features in this article. Additionally, if you want to hide your Last Seen time from others, without having to compromise viewing their Last Seen times as well, you can stay active on your secondary account while being idle on your primary account. That way, the people who only know your primary contact number, won’t be aware of your activity using the secondary account! The rebuilt version of IPA file can be found by navigating through the directory tree within the “products” folder created within the ppsideloader directory. The IPA file can be found at the very end of the tree. The Apple ID that you have used to sign the IPA file is a free developer account, and apps signed with this account will stop working within a few weeks; post which, you need to re-sign them once again. Having a backup of the modified IPA file allows you to skip the long process. You just have to install the IPA using Cydia Impactor. Moreover, if you don’t have a Mac, you can rebuild the app on a friend’s Mac (if available) and install the modified IPA using Cydia Impactor (which is also available for Windows). Note: This method of installing multiple versions of the same app works for all the apps created by UnlimApps, which includes, Facebook++, Instagram++, Messenger++, Poke Go++ for Pokemon Go, Snap+ for Snapchat, Telegram++, Twitch++, Twitter++, Viber++, Vine++, WhatsApp++ and YouTube++. Most of these apps are already available on the BuildStore. So now you know how to use multiple WhatsApp accounts on your iPhone. Share this article with your friends, colleagues, family members; just spread the word. And if you have anything to say, share your opinions in the comments below.